Automacad offers both standard and custom Wet Cast solutions adaptable to a wide range of clients, from the young, limited in production volume to the more experienced and high production volume manufacturers. 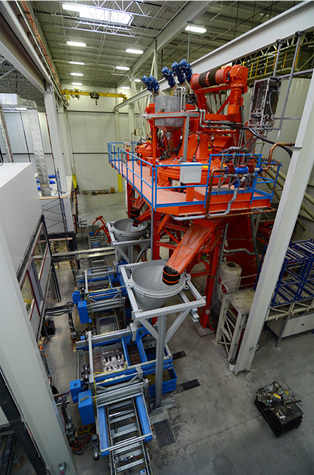 In other words, our Wet Cast production components could easily fit within an already existing manual, semi-automatic or fully-automatic production line while our turn-key projects provide a made-to-order solution to your specific needs. Also, since our lines could be as modular and versatile as they are dedicated, manufacturing a full range of different product types such as masonry, slabs, walls, steps, veneers, edges or caps of different shapes and sizes on a single line is as easy and efficient as producing a single product category. Our equipment can be customized to your existing production lines! This means that our lines can easily adapt to various types of molds, whether polyurethane, ABS, silicon, steel, single or multiple cavity molds. The customized adaptation of our Wet Cast lines to your facility makes your production streamlined, flexible and, above all, versatile in relation to your various products while also minimizing your configuration time and costs.